Spending a week in the pool talking business? Yes. Two weeks ago I was in Cabo San Lucas at CaboPress soaking up some serious business knowledge (and sun). I went last year and it was a great experience, so when I had the opportunity to attend again, I jumped on it. Last year, I wasn’t sure what to expect, but this year I had a pretty good idea. I was attending with the goal of discussing some upcoming changes to my business and getting insight from others on the best way to make these changes (and whether it was a good idea). Something I’ve struggled with over the past few years is finding the right format, pricing, and positioning for my courses. Initially I was selling individual workshops, but when I had created too many I bundled them all together into a membership. That’s not what I want–I want my students to complete the content and I don’t just mean watch videos–implement what they learn into their businesses. Back when I only had a few workshops the completion rates were really high, but the more I add, the less likely it seems that any students are completing any workshops. So going into Cabo, I was looking for validation on turning my membership into a higher-end course where instead of leaving students to fend for themselves, I would lead them. (Psst! If you’re in the membership you’ll get automatic access when the course launches). Besides a great pool discussion about courses, I spoke to many people one-on-one about this plan, and got some great advice on making the transition. The biggest thing? No one even came close to saying that I should keep the membership model. Everyone said that I should change the format to a course. So look for my new course coming in 2019! 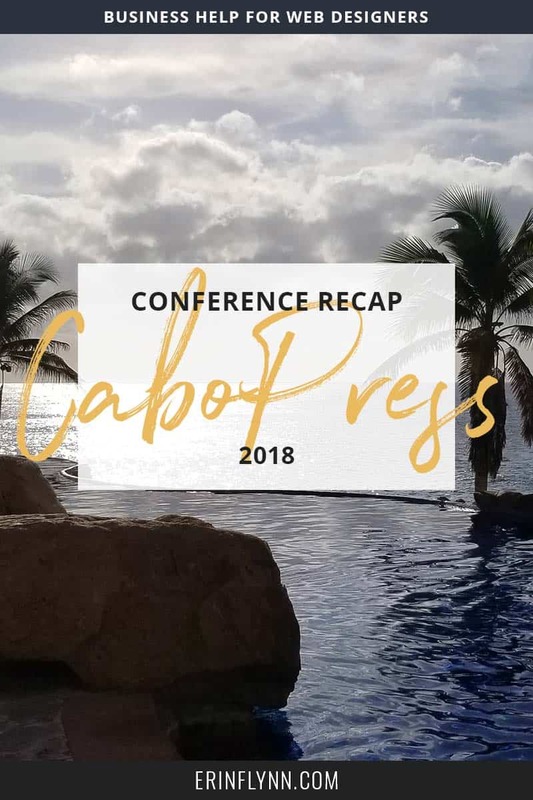 One of the best things about CaboPress is that unlike other conferences, you have lots of time to make connections! You have every afternoon free, and since everyone is staying at the resort, you get to spend the evenings together too. I loved seeing familiar faces and meeting new people. The group was smaller this year, so I think I actually got to talk to everyone which was great! I love being able to actually connect and spend time with people, instead of feeling rushed like at other conferences. There were so many great discussions and insights with everyone! My roommate was Rian Kinney, and we hit it off really well, and I’m looking forward to making her my go-to for everything legal. We had a blast together and had some hilarious stories, but since we’re not snitches that’s all you’re going to get out of me. I learned a ton, and had such a great time! But we’d be here all day if I covered everything. I’m excited to start using real content personalization, collaborate with several people, and get my new course launched! In fact, I’ve been working a lot on my new course since I’ve been back, and it’s about halfway done! CaboPress gave me the kick I needed to really make it happen. Thanks, Chris Lema, for another awesome event in Cabo!